Jour d'Hermès Gardénia is new from Hermès, and since I was charmed by the original Jour d'Hermès, and even more charmed by Jour D'Hermès Absolu, (and yes, longtime readers know I am a fan of the brand in general) of course I wanted to try it. It helps, of course, that I also love gardenia. A quick recap: Jour d'Hermès was meant to be gardenia and sweet pea, and the Absolu was gardenia and jasmine. To my untrained nose, they were both abstract bouquets, of the dewy-springtime variety, with the Absolu a bit more floral than the regular. I expected about the same of Jour d'Hermès Gardénia, which promised gardenia, rose and jasmine. Nope. This time, there's gardenia, and rose, and jasmine. What I called a 'leafy spring bouquet' in the original is now a fuller, headier mix — for Hermès, mind you. What is heady for Hermès would not pass muster over at Tom Ford. The opening is crisp light citrus, without the heavy grapefruit of Absolu. It is overtaken, almost immediately, by the floral notes, which smell odd, almost smoky, for about 90 seconds before resolving into something more like flowers. It is still a mixed bouquet, but early on, heaviest on the gardenia: there is a short window of time (maybe 15 or 20 minutes?) in which I think someone might smell it blind and said, ah, a gardenia fragrance.1 At any rate the gardenia, while heavier than I expected, is still, for gardenia, dewy and clean: no indoles, no mushroom-y growth underneath. Instead, Jour d'Hermès Gardénia has a definite murky-green-water undertone which I could not make up my mind about, and when there was some discussion of swampwater in the comments to Tuesday's review of Penhaligon's Ostara, I thought of Jour d'Hermès Gardénia. After the gardenia phase, Jour d'Hermès Gardénia went back to the more blended bouquet, then, all too soon, it just seemed to give up entirely. Neither Jour nor the Absolu version are powerhouses (they are both Eau de Parfum but perform more like Eau de Toilette) but I am not usually looking for powerhouses. This morning I did a test: 3 sprays of Jour d'Hermès on one arm, 3 sprays of Jour d'Hermès Gardénia on the other. At two hours, I went outside into the warm air. The Jour d'Hermès was light but pretty; the Jour d'Hermès Gardénia was still there, but just a bland green-ish blur.2 Another spot on my shoulder with Jour d'Hermès layered with Jour d'Hermès Gardénia made a better showing (and I liked that combination better even at one hour). Verdict: Jour d'Hermès Gardénia surprised me by being so much what it said it would be, and then I surprised myself by not loving it on the spot — even during the early stages, when it still has some life to it. It is pretty, but the regular version is prettier, and the Absolu prettier still.3 I may come around to it, but I don't think I'll ever like it as well as the first two iterations. I am very much looking forward to hearing other opinions; please comment if you've tried it! 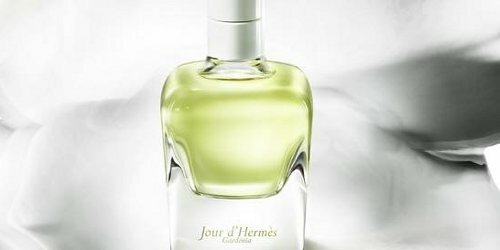 Hermès Jour d'Hermès Gardénia is available in 50 ($110) and 85 ($153) ml Eau de Parfum. 1. Wearing Jour d'Hermès Gardénia next to the regular Jour also made the 'gardenia facet' in that one more obvious. Or, I'm dreaming. 2. I did NOT try this test with Le Jardin de Monsieur Li, but I doubt it would make much of a showing at 2 hours either. 3. And I did not try layering Jour d'Hermès Gardénia with Jour d'Hermès Absolu. I loved it! I need to get another sample though as I gave mine to a friend who is trying to choose a new perfume…. I love the Absolue especially and the original one. Gosh I seem to just love all of them. Would be ridiculous to buy all three clearly I have a weakness for gardenia. When I have spent more time with it I will report back! Very interested to hear others impressions on this one. Good, glad someone loves it! If this one ends up in the 15 ml discovery sets, you *could* do all three! I already have the big bottle of the original so I’m done. The discovery set has my name on it. Fingers crossed. I was hoping you’d put this review up this week! I can’t wait to smell this. Ironically I found the original had a bit of that brackish green note which put me off of it originally. Now I own a bottle of the original and want a bottle of the absolue! I’ll pop back in when I’ve tried it. Excellent, please do come back and tell me if you think this one is MORE brackish or less. I wish I had the Absolu too, I think I’d wear it more than the original. I find the original a bit more androgynous, thanks to that strange greenness. Yet I love it! My heart is drawn to the lush elegance of the absolu as well, sadly. Hopefully all of these will make it into the 15ml sets. Gosh, that is true, but there’s more of the strange green in this one and still it is more feminine. I think. We’ll see what you think. I’ve been dying to try this one too. I love the original and love gardenia, so it should be perfect, right? As of yesterday, they didn’t have it at my local Nordstrom (the SA showed me the Absolu when I asked about the gardenia though, so who knows). I’m interested to hear what others think of it, given the fact that you didn’t love it. Hope it will get more widely distributed soon. I have not yet seen even Monsieur Li in many department stores though. At my Nordstrom yesterday, they had Monsieur Li, but not JdH Gardenia. My Nordstrom is currently pushing Monsieur Li. I have not seen the gardenia yet but will certainly try it when I see it. I was at Bergdorfs earlier today but didn’t look for it there. Thanks. I need to get in there and see if they have the M. Li body products. I wouldn’t be bothering to comment at all since I am among those who did not fall in love with the original Jour d’Hermès…didn’t hate it… but was put off by something hard in it that felt like it shouldn’t be there…but reading the comments of others I now feel 1) vindicated and 2) interested in trying it again to figure out what was going on. What predominantly gardenia perfume do you wear and love? My favorite dream gardenia (I say dream because I don’t own it, and don’t even have a sample & have not smelled it in years) was Strange Invisible Perfumes Lady Day. The Isabey was pretty (have not smelled that in years either & would think it’s been reformulated since). All my other favorites are really gardenia / tuberose blends. I’m still intrigued enough to put this on my to-test list. I love the original Jour, which surprised me because I didn’t think I was a citrus fan. The bottle definitely qualifies for the bottle p*rn thread, imo. Yes — and like this color best of all 3. I was so happy to see this review of another Hermes Jour. I have a pathetic weakness for a number of Hermes fragrances and especially those of Jean-Claude Ellena. These scents are so often tender, but for me they are inexplicably tenacious. I don’t feel like a perfume-bomb when I wear Jour d’Hermes, but it is usually still with me the next day, even after a shower. Subtlety is one of my favorite perfumer’s tricks. I’m excited to try the new Gardenia scent. Maybe it will help me stop sniffing my neighbor’s gardenias. Gosh, we share that weakness! Do give this one a sniff and see if you like it better than I do. I have 30 ml of both Jour and Absolu and use both frequently with love. I thought 30 ml of Gardenia would be justified, but I see, only 50 ml is available… Also I do not have a possibility to test where I live, so it would be a blind buy – and still I am very tempted to have this in my collection. I wonder if Gardenia is limited edition? I have not seen a 30 ml so far but that doesn’t necessarily mean there won’t be one. No idea if it’s LE — I am not much help, sorry! I noticed this on the shelf of a Sephora in France. I didn’t try it though as Jour d’Hermès is one of the few Ellena creations that I really do not like. Le Jardin de Monsieur Li on the other hand will probably be my next Hermès purchase. I found it very lovely. I want that one too! Hmm, intriguing. I love gardenia and I like the Absolue (almost cannot smell the original), so I’ve been waiting to try this. I’ll see tomorrow if they have it at Brussels airport. No idea how widely it’s distributed yet — good luck! Thank you for the review, Robin! I love the original Jour d’Hermes, and I love gardenia. Very interested in trying this.